Received an alarmed e-mail today from a reader, who was concerned that when you type the word “Scalzi” into the search function at Barnesandnoble.com, the first several listings are for shabby-looking books that appear to be illegal compilations of my work (here’s one of them). In fact they’re not, but what they are isn’t substantially better: Some geniuses have hit upon a scheme of cutting and pasting Wikipedia articles into what appears to be publish-on-demand books and then charging people ridiculous sums for the collation. The link above is to 32 pages of Wikipedia articles on my books, and the charge for this service is $12.72. That’s a pretty obnoxious amount to charge for something someone can read for free online, or could print out themselves for pennies. I won’t speculate whether grepping content from Wikipedia and then trying to sell it to people represents a violation of Wikipedia’s Creative Content license, but I will note that on its FAQ page, the publisher here claims that they charge for everything but the content, which is the sort of delightful hair-splitting that would probably get destroyed by any competent lawyer. I don’t particularly care if these folks sell Wikipedia articles about me as books — it’s a stupid business and you’d have to be stupid to buy the books, but apparently there are enough stupid people out there to make it work — but what I am annoyed at, as an author, is that when people go to the Web site of a major retailer and search on my name, the first several references they get — the “Top Matches” — are to crappy insta-books I didn’t write. Call me crazy, I think the “Top Matches” for my name should be my own work, not the work of Wikipedia-snurching bottom-feeders. Likewise, it would be substantially less than awesome if someone desiring to purchase my work clicked on the book bearing the name of four of my works, paid for it, and then got a tiny, slim volume of Wikipedia articles. 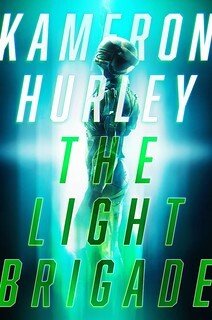 Because that reader may end up pissed off. And that’s not good for me. Dear Barnes & Noble: You know, when I type in “Scalzi” at Amazon, the first nineteen references are books I wrote. At Powell’s it’s the first twelve. At IndieBound it’s at least the first fiften. So, do you think it’s possible that the Web site of the nation’s largest brick and mortar bookseller might actually put one of my books in the top five references when you type in my last name? 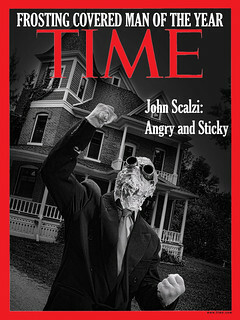 Or at the very least, some author named Scalzi? It’s not too much to ask. Thankfully, searching “John Scalzi” turns up my work, but I think the “Scalzi” thing is sufficiently problematic to give you a head’s up about it. If you could fix that, it would be lovely. For everyone else, well, if you see a really crappy looking book with my name on it (or the name of any other writer, for that matter) in the Barnes & Noble search function, see if the publisher is “Books LLC,” and if it is, run away from it. I didn’t write it, and you can get what’s in it for free online. And besides, all the books by me from real publishers don’t look like crap. They look awesome. 1. I’ve checked the site with on Windows with Firefox/Chrome/Safari/IE 8, and it seems to render just fine with each of them, so I don’t anticipate any problems there. That said, when I checked it on my wife’s iPad I noticed that the text runs right up on the left margin. I don’t know why it renders that way or what I can do about it, but I will look into it. In the meantime, if the margin thing becomes annoying to you on the iPad, I’d suggest in the short term looking at the site through an RSS reader. That might help. Update, 11:48am: regarding the left margin thing, I just switched the theme to “flexible” setting, which means it expands/contracts the layout to fill the space provided. This means you on Mac Safari/iPad/tiny laptops should now see a left margin. I’ll see how I like the flexible setting over the next day, and if it doesn’t drive me nuts, I’ll keep it. 2. The theme allows the owner the option of showing icons called “Gravatars” alongside the comments, and at the moment I’m allowing them and am inclined to keep them. When someone doesn’t already have a Gravatar set up, it procedurally generates one based on one’s e-mail (I think), so that explains the fractal-ly images. However, if you would like to customize your Gravatar as it appears here, you can go to the Gravatar site and make your own. Gravatar is owned by Automattic, which also owns WordPress.com, so it’s not a completely unknown company, and it means that the Gravatar should work consistently across a whole bunch of sites with WordPress installed. Just make sure the e-mail you use to comment here is the same one you use for your Gravatar (you can create more than one, depending on how many e-mail accounts you use to make comments). 3. If you have additional feedback about the look/feel of the site I’m happy to hear it but be aware I’m constrained in what changes I can make by a) the restrictions WordPress has on those using their system (for reasons of load-balancing and/or not having the whole system brought down by viruses and bad coding) and b) my own questionable competence. At the moment, the only major (i.e., non-cosmetic) change I’m looking at is finding a way to bring back a “comment preview” button; if I can manage that I will let you know. Otherwise, as noted, we’re pretty much where we’re at for a while. I hope you like it. Hey, remember that awesome lightsaber duel in The Phantom Menace? And remember how you thought, “Man, this is so cool that I wish the rest of the film had been this cool too?” So do I, my friend. So do I. Which is why I write about the tragedy of the One Cool Scene in an otherwise crappy science fiction film in this week’s Filmcritic.com column. Come and let’s feel each other’s pain together. Remember to leave your comments of commiseration there. Because I busied myself with revamping the site last night, I went to sleep blissfully unaware of the election results, and then woke up, refreshed, to deal with what went down. Here are some early thoughts. * It’s not Blue America or Red America, it’s Orange America! 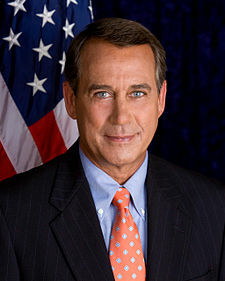 Yes, my representative, John Boehner, America’s Tallest Oompa-Loompa, is now the presumptive Speaker of the House. As I’ve noted before, I don’t think the circumstances that allow for his speakership are such a good thing, but that said, it’s certainly not bad for my district. I think prior to last night there was some discussion as to whether or not Boehner was actually the slam-dunk favorite for the Speaker position, but I imagine that winning the largest House swing in, what? 62 years? means that the guy in charge of the GOP in the House will see some benefit from that. Boehner also quite obviously won my district, and by the usual amount, about 66% to 30%. Sorry, Justin Coussoule. You know I voted for you, man. Elsewhere in Ohio, it was a GOP night as well, with GOPers taking the big state positions as well as our Senate seat that was up for election this year. It’s a mirror image of the result in 2006, and the GOPers elected here by and large qualify as mostly moderate (as did the Democrats four years ago), so I think this is less about Ohio being hugely blue or red and mostly about it being the bruised purple it’s been since I’ve been here. * As for the GOP tsunami in the House, well. It’s not what I wanted. You might recall that in 2006, when the Democrats took the House, I said that I felt the US had taken a sanity pill; right now I think the US might have gone off its meds. The GOP, its practices and its brain trust haven’t really changed between now and then; it’s the same intellectually dim bunch who led the economy and country into a wall during the 00’s. Insanity is often defined as doing the same thing and expecting different results, so congratulations, folks, we’ve gone a little nuts here. Inasmuch as the GOP political strategy of mendacious loudness paid off in spades last night, I don’t really expect anything else out of them except more of the same for the next two years at least. We will see how well that strategy works in the long term, but obviously at this point there’s no reason for them not to keep doing it. * But as I’ve noted before, the GOP may have put a gun to the head of the Democratic majority in the house, but it’s the Democrats who said, “dude, you’re holding it wrong,” jammed the gun into their own temple, and then pulled the trigger. The most accurate word I have for my feelings about the Democrats right now is disgust; disgust that they could get elected on a platform of substantial change, execute on many of the changes they campaigned on, and then allow the GOP and its allies to turn those actions in liabilities — well, again, disgust is not too strong a word. Dear Democrats: You managed to lose the House in historic proportions to a party whose strategy was to harness the inchoate anger of old white people so stupid that they don’t sense the inherent contradiction of screaming about a smaller government whilst cashing their federal checks. You are morons. Please find someone who can play this game and put them in charge of your electoral strategy, because what you’re doing now isn’t working. Also, henceforth, every time you whine about Fox News and shadowy financiers of the Tea Party, we get to beat you with a hammer. This is the political landscape now. Deal with it. * Ironically, the Democrats might have lost the Senate too, if not for Sarah Palin, who used her appallingly not-inconsiderable political weight to back the vaguely-insane candidates Sharron Angle and Christine O’Donnell in races that might otherwise have easily gone GOP with more mainstream, non-insane candidates. At this writing, the Democrats have 51 seats in the Senate, but they could have had 49, and it’s fair to say that it’s not so much that the Democrats held the Senate — the Democrats didn’t hold a damn thing last night — than Palin lost it for the GOP. This naturally suits me just fine. Dear GOP: Please keep using Sarah Palin for everything. * For everyone exulting/panicking that this means Obama’s a one-termer: After last night, do we really need to be reminded that two years is a very long time in politics? Let’s also recall how horrible the 1994 mid-term elections were for Clinton’s re-election chances in 1996, i.e., not really at all, thanks for asking. So please, tamp down the freaking out or gleeful rubbing of hands together, depending on your political inclinations. Let the future take care of itself, and let’s focus on the now. That said, now quite obviously isn’t good for Obama, and once again I think the fault for that lies less with Obama than it does with the Democrats in the House and Senate, for the reasons noted above. This isn’t to absolve him of blame, mind you; his held-in reserve, non-losing-his-mindness demeanor suits me fine but I think the rest of the country would probably like to see him more worked up, and in the end he really should have ridden herd on the Democrats a lot harder than he did, and punished every one of them who wandered off the ranch. And now he gets to deal with it for the next two years, at least. * The good news for people philosophically aligned to Obama’s plans is that a) he did have those first two years, in which despite everything he managed to get quite a lot done, and b) thanks to Sarah Palin, the Democrats have kept the Senate, so what we’ve got here is a divided government. This means that the things already passed on Obama’s agenda aren’t going to go away (although their funding might, which is a not inconsiderable thing) and that assuming as I will the GOP isn’t suddenly going to transform itself into a pragmatic and moderate party willing to work with Democrats and the President, the House Republicans are going to see lots and lots of stuff die in the Senate. The bad news for people philosophically aligned to Obama’s plans is that, well, you’ve had your fun now, haven’t you. The House is dead to you as of January, and it won’t be the quiet sort of dead; no, it will be a “fast zombie” sort of dead, the kind that rushes you and wants to feast on your brain while ripping open your guts. Enjoy that. * Contrariwise, the good news for people philosophically aligned against Obama’s plans is that a) divided government means the president’s legislative agenda comes to a grinding halt, b) the GOP has two years (at least) to make its case that they are better stewards of government than Obama and his crew. The bad news here for you is that the GOP this time around wasn’t elected because of its legislative philosophy, it was elected by a bunch of folks screaming “do something” without particularly well enunciating what it is they want done, except possibly thwarting Obama. However, Obama, who is not stupid, will likely shift his focus to administrative implementations of his agenda, and while the House may howl at this, any attempt to stop him is likely to get spiked in the Senate, or vetoed. So not only will the GOP not be thwarting Obama on many significant things, it also won’t be able to do much of anything legislatively, either. And it will be interesting to see how that plays out in the next couple of years, and in the 2012 election. All of which is to say it will be an interesting time for everyone. Just what we all wanted. * And you may ask, that’s all very interesting, John, but what does the election mean for you? Well, I’m touched at your concern and I’m glad you asked. One, as I noted, my Representative is very likely to be the next Speaker of the House, and that’s probably excellent for my district, and so naturally I’ll benefit from that. Two, as most of you know, I am white, male, heterosexually-paired and well-off, which means of course that the GOP has totally got my back. So while I am philosophically not aligned with the real-world aims and goals of the Republican party at this time, on a direct and personal level, the short-term effect on me is either neutral or mildly positive. So thanks for your concern, I’m fine. It’s folks not like me who might be twitchy. And oddly enough, most people aren’t the whole package of white, male, heterosexually-paired and well-off. I’m puzzled that enough of you keep looking out for me, even when I really don’t want or need the help. Really, folks, I and people like me are fine. Take care of yourselves, please.